Enabled through software like the ModelMate project that makes it easy to integrate open EA data with open source and COTS (commercial off the shelf) software for modeling, analysis, machine learning and visualization. 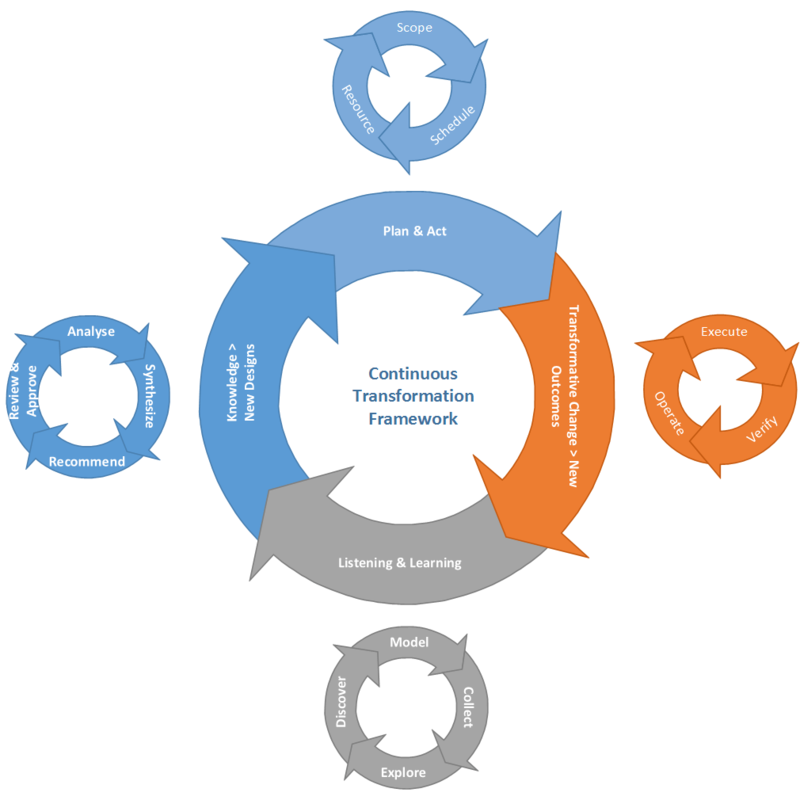 Automated enterprise architecture modeling (and automated application architecture analysis) are activities that belong to the Listening and Learning phase of the Continuous Transformation Framework. Supporting the above themes, the Technology layer diagram below is automatically generated from a simple, single line query applied to an automatically created and dynamically maintained model of 500+ Windows and Linux servers (blue dots) with 550+ server network adapter configurations (yellow dots) connected to 25 network gateways (blue dots representing 25 network routers/switches). The data originates from a series of tables maintained by a configuration management database (CMDB) solution. There is no way to understand what the Technology environment looks like by simply looking at these tables. However, in the visualization below, it is easy to see that there are at least 14 different server farms, application clusters, and data centers. 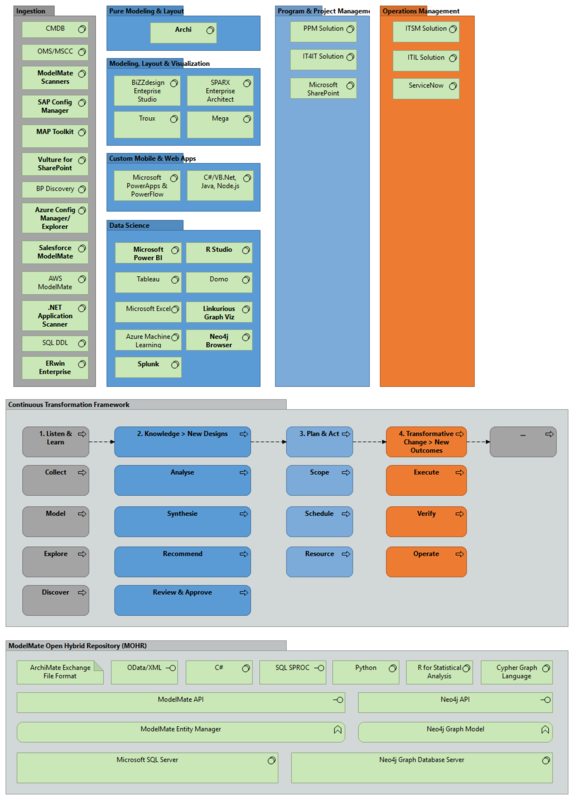 In this ModelMate model, servers are represented by Nodes with 179 properties; network adapter configurations as Devices with 69 properties each; and, network gateways as Devices with 4 properties per device. This is just the beginning as additional information about web application, database, DNS, and directory and domain management services is used to add additional detail to the current state Technology layer of this enterprise architecture. “More news at 11…” (click here). 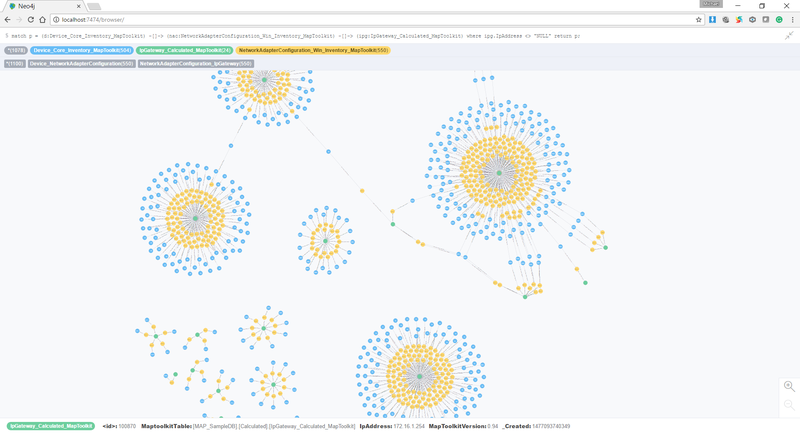 This effort was made easier through the use of ModelMate and the Neo4j Community Edition free, open source graph database and the Cypher query language. Interesting start. 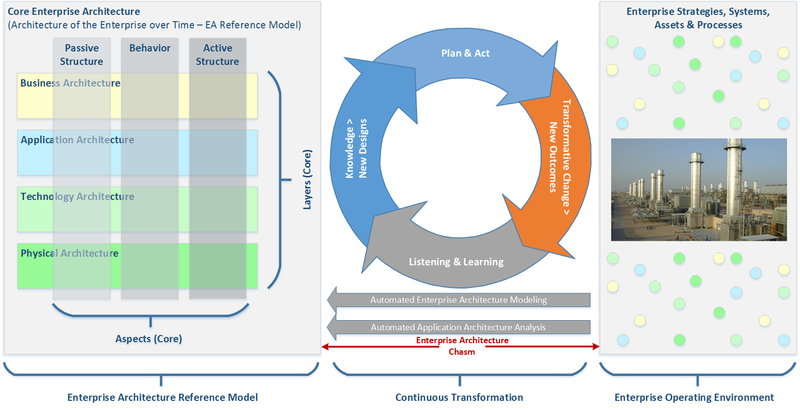 I’m not sure if “automated Enterprise Architecture” is a good goal however, in the sense that EA is not really “about” the models. As you probably know, an effective Enterprise Architect brings insight to decisions. Models help to visualize reality but their analysis brings insight and often the best way to analyze a model is to be directly involved in creating it. Won’t automation of an EA model (outside the ease of creating it) simply diminish the available insight? Are you planning to add features to make up for the loss (such as autodetection of conditions that may illustrate variations with business strategy or efforts running counter to a principle)? Also, while computer servers are discoverable from within a network, it would take an AI to discover business terms and business processes from within a network. This limits the reach of your efforts. Have you considered that? There are a few discovery tools on the market. How will your efforts compare to them? I’m mostly leveraging existing discovery/inventory tools (e.g. MAP Toolkit) …no need to re-invent the wheel here. I agree with your earlier points. In fact, there is an overarching Continuous Transformation framework that this all supports “in the fullness of time”. Here’s a sketch: https://i2.wp.com/hyperonomy.files.wordpress.com/2016/11/progressive-ea-model-1-0-11-peam5-1010.png (this hasn’t been published as part of a blog posting (yet)).